This truly groundbreaking paper by M Mehdi Doroudchi, Kenneth P Greenberg, Jianwen Liu, Kimberly A Silka, Edward S Boyden, Jennifer A Lockridge, A Cyrus Arman, Ramesh Janani, Shannon E Boye, Sanford L Boye, Gabriel M Gordon, Benjamin C Matteo, Alapakkam P Sampath, William W Hauswirth and Alan Horsager demonstrates that channelrhodopsin-2, a cation channel from algae than can be gated/activated by light can restore both physiological and behavioral visual responses in mice with retinal degenerative disease. These are early days in retinal degenerative disease rescue with many competing strategies to cure blindness. However, gene therapy based strategies are likely going to be the most successful ones that will be able to help the over 15 million people worldwide who suffer from retinitis pigmentosa (RP) or age-related macular degeneration (AMD). The fundamental idea which has been published many times before under the theme of optogenetics, is to combine genetic and optical approaches to obtain desired effects in specifically targeted cells. 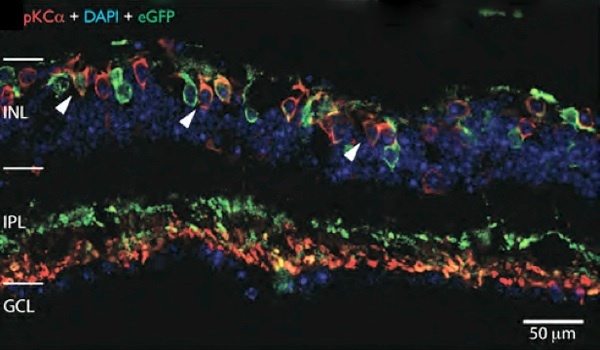 The approach in this study has been to target specific cells in the degenerate retinas of models of human blinding disease and attempt to use those cells as surrogate photoreceptors to drive the remaining retina. Furthermore, this study targeted later stage retinal degenerations in 3 different mouse models of blindness, the rd1, rd10 and rd16 lines which recapitulate many features found in human retinal degenerations. These animals recovered their lost visual function and exhibited visual responses up to 10 months post-treatment which is tremendously exciting. Importantly, additional work detailed in this manuscript defined a safety profile for the therapy which demonstrates localization in the cells of interest, limited local immune response and an absence of any systemic response. The future of this work will rapidly move towards therapeutics, but will depend upon comprehensive evaluation in large eye models of retinal degeneration before clinical trials can begin. If that work can be funded, one might conservatively predict clinical trials in 5-6 years, helping people to recover lost vision and regain a measure of independence from assistive devices.